As we sat in the Rumah Makan in the small village of Cimaja, brushing away the occasional mosquito or local cat, I put a bite of vegetables in my mouth. “You know those are raw,” Jen said questioningly, looking up at me. I stabbed another cucumber, and replied in as suave and James Bond-like a voice as I could muster, “I like to live… dangerously,” taking another bite. Jen grinned. “You eat those dangerous vegetables,” she said, laughing. I should say, however, that I did leave behind a very well paying job that probably had some potential to advance my “career.” This was a move that everyone from my friends, to my boss, to my new acquaintances overseas have all gawked at. But I didn’t just give it up on a whim. I gave it up because I felt it was the only path available to me. There are two basic goals that drive me: get happy, stay happy. I’m not a fan of hedonism, which I’ve heard it pointed out is a philosophy that only ends in a heroin overdose, but I do think that happiness in this life is the most we can hope for. I also think that it’s probably a good idea to take a long term view regarding our happiness. Hence the stay happy bit, which I think the popular understanding of hedonism lacks. It’s also important to remember that happiness is a complicated human emotion, despite what the scientists have told us about dopamine. A good parent is still happy to have children even when changing diapers, for example. 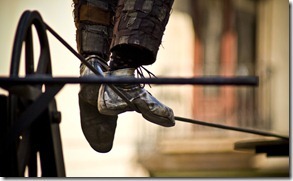 Getting back to my point, the reason I left my job; I was in a situation that I couldn’t possibly be happy with. The culture was all wrong, the staff ranged from had-potential-but-burnt-out to nice-guy-but-incompetent; the work, while not uninteresting, was so tangled up in red tape, bad decisions and worse planning that it was an endless frustration; and lastly I lost faith in the leadership’s ability to actually leverage the talent they did have working for them. So, at some point, even with all the benefits and bonuses and salary and stock, the question becomes: What is the price of my happiness? And unfortunately you can’t buy your happiness – you can only sell it. In the long run who knows, maybe I’ll pick up my career where I left off, or maybe I’ll use my head, show some adaptability, and do something else. Either way, I’m much happier now than I was before, and I’m confident that I can find work in which I can remain happy. Diane: Nobody believes this is going to work, do they? Lloyd: You just described every great success story. 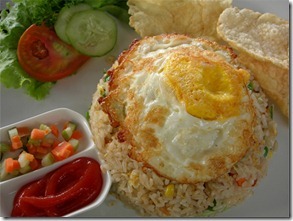 Nasi Goreng Ikan Asin: This file is licensed by Rizka Budiati under the Creative Commons Attribution 2.0 License. See http://www.flickr.com/photos/47196317@N00/862446765/ for more information. funambulist 02: This file is licensed by Wiros under the Creative Commons Attribution ShareAlike 3.0 License. See http://www.flickr.com/photos/91515119@N00/1795141144/ for more information. 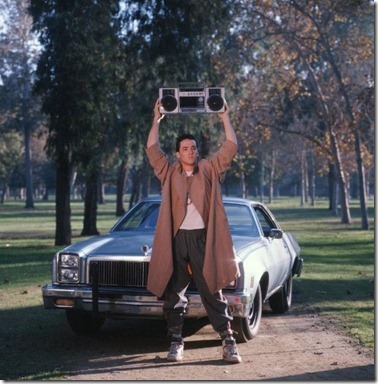 Hopefully use of this sceen shot from Say Anything is fair use. Someone needs to build the mass transit systems so you can “jump on the bus”. That’s where I come in.